ASI Aeroacoustics is recognized worldwide as an authority in the combined science of acoustics and aerodynamics, or "aeroacoustics". 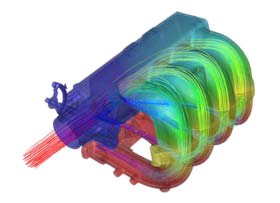 As such, our engineers are experts in applying advanced Computational Fluid Dynamic (CFD) modeling technologies to complex architectural and engineering design problems and provide client management-design teams with the answers needed to implement the next level of advanced, high performance system/building designs or diagnose and remediate an existing problem. All of the above possibilities for a given configuration of interest, during the design phase or as diagnostics for an existing physical entity! ASI Aeroacoustics will generate existing or proposed site dynamics for analysis and computer simulated model changes for review, as required. 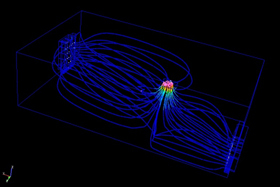 The computer model quantitatively, visually and animatedly predicts what will happen when fluid flows within and/or around a structure. During pre-construction CFD analysis, our engineers reproduce real-scale geometry to model a 3D structure. 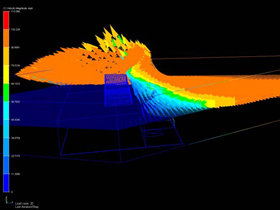 Computer simulations of proposed designs, options and/or various conditions (physical, fluid and/or climatic) are accomplished, providing data and visualizations of what will happen in real life when these conditions, physical shapes, events and weather situations occur. These results are then applied to the design in the engineering phase or as recommendations for remediation - as a source for answers, suggestions or strategies. CFD predicts 3D aerodynamic and hydraulic performance inside and outside a structure by using the principles of proven fluid flow, providing the ability to troubleshoot and confirm efficient designs. In essence, it allows decision makers, engineers and regulatory agencies to visualize what occurs within and around a conceptual or real structure at a level of visual animation and detail not possible to witness onsite, with wind tunnel modeling, smoke tracing and/or area sampling. 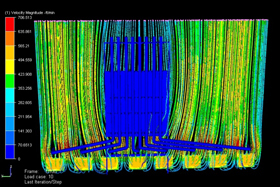 Utilizing ASI Aeroacoustics CFD capabilities during a project's design phase achieves cost effectiveness through system efficiencies and confirms theoretical concepts. As a diagnostic tool, expensive and wasteful "cut and try" efforts are avoided! By 3D computer modeling fluid flow of a prospective or existing design, CFD provides insight into how the design will perform based on a proven scientific foundation. Should the need arise, recommendations may be empirically substantiated with scale model testing in ASI Aeroacoustics aerodynamic flow bench or via large scale wind tunnel performance. Our CFD design analysis and/or remediation diagnostics will provide an engineering management team with solid answers for quick decisions, optimal design selection, cost savings and last but not least, a little peace of mind! Let a qualified ASI Aeroacoustic engineer assist you to establish an effective protocol and implementation schedule. Let our almost 40 years of experience make your job easer.